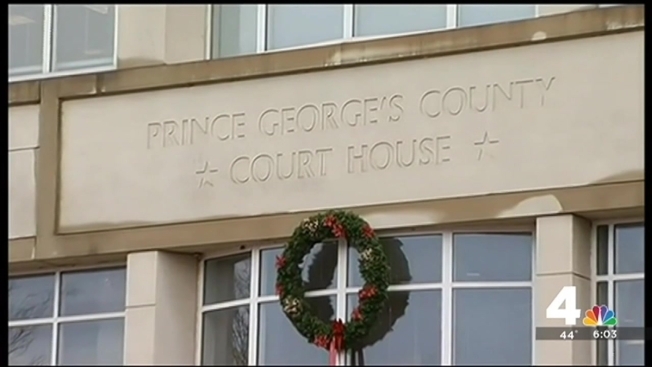 A Prince George's County police officer will spend five years behind bars for holding a gun to the head of a Bowie, Maryland, man. Officer Jenchesky Santiago was found guilty last month of first and second-degree assault, misconduct in office and the use of a firearm in the commission of a crime of violence. He was sentenced to five years in prison on Friday. Cellphone video played during the trial showed Santiago saying, "I dare you to f---ing fight me, son," while pointing his service weapon at William Cunningham's head. Cunningham and his cousin were sitting in a car parked in front of his Bowie home in May 2014 when Santiago approached and asked why they were there. After an exchange of words, Cunningham decided to go inside, but Santiago ordered him back in the car. A witness testified Santiago also yelled that Prince George's County officers shoot people. “Mr. Santiago’s actions that day and the fact that he continues to show no remorse for what he did and believes that the victims should actually apologize to him, shows that he had no business serving in our police department," Prince George’s County State’s Attorney Angela Alsobrooks said. Last month, Prince George's County Police Chief Mark Magaw said he would recommend that Santiago be fired, adding that there is a process they must follow.